Has an 8-size pencil guide with automatic pencil stop. 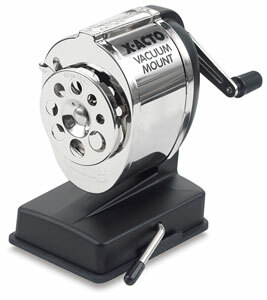 Vacuum locks sharpener in place on any non-porous horizontal surface--just flip lever in base. Crank operates solid steel gears. Speed cutters have 30 cutting edges.